I’m on a marble kick! 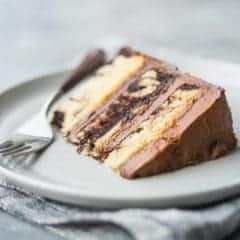 Last week I posted these incredible marbled cheesecake brownies, and now here I am sharing this gorgeous marble cake with you today. What can I say? When you can’t decide between 2 amazing desserts, marbling is the perfect solution! 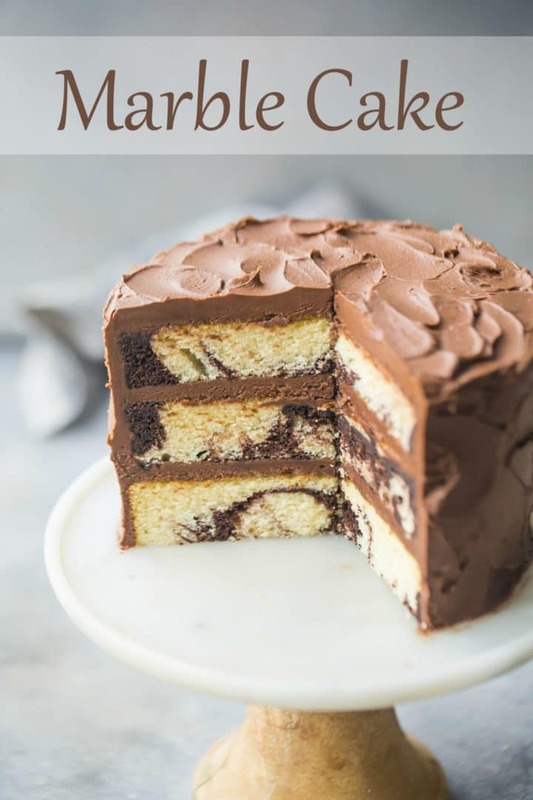 I already have an amazing marble bundt cake recipe on this site, but I thought it was about time I made you a layer cake version. I haven’t shared a layer cake since that Boston Cream Pie back in June! 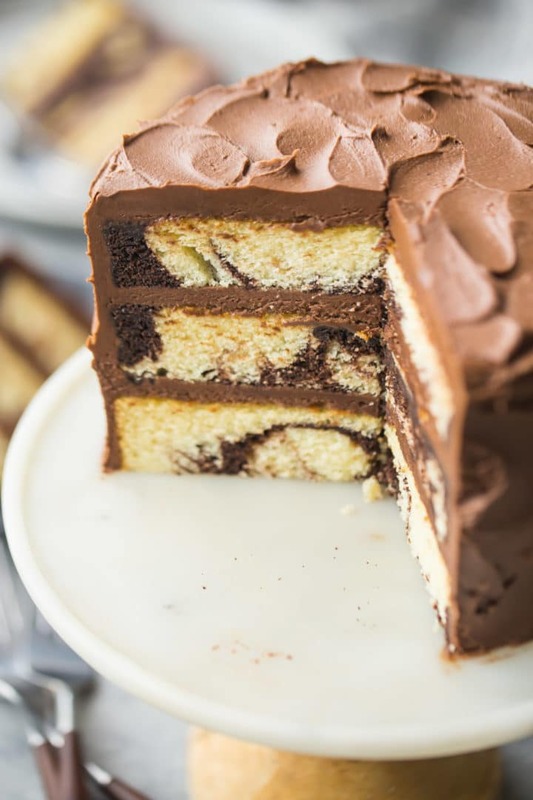 When you’re not sure whether you should make chocolate cake or vanilla cake, marble cake is the answer. It’s the best of both cake worlds! Chocolate and vanilla swirled together. A total win for everyone! This recipe starts with my favorite vanilla cake. You’ll love it because it’s so incredibly soft and moist, and easy as can be to make in just one bowl. Divide the batter into two separate bowls and and stir half of it together with a mixture of cocoa powder and water. Then just fill your cake pans with alternating spoonfuls of each, and swirl together! Start by combining the dry ingredients in a big mixing bowl. Cake flour, all-purpose flour, sugar, baking powder, baking soda, and salt all get stirred together until combined. If you are unfamiliar with cake flour, you can learn more about it by clicking here: Why Use Cake Flour. Once your dry ingredients are combined, you can add the butter. Just mix it in for a minute or so, until the mixture resembles damp sand. Then add the eggs, one at a time, stopping to scrape the bottom and sides of the bowl with a silicone spatula after each addition. This will really insure your cake batter comes out smooth and lump free. The final additions are sour cream, milk, and vanilla. If you don’t have (or don’t want to use) sour cream, there are substitutions noted in the recipe card below. In a smaller bowl, stir the cocoa powder and water together until smooth, then add half the vanilla cake batter. Stir it together, start dropping it by spoonfuls into the cake pans, and swirl! I chose to bake this recipe up in 3 6-inch diameter round pans, but it can also be made in 2 8-inch pans or 9-inch pans. Or you could make it in a 9×13-inch pan. Just be sure to adjust the bake times as needed, if you’re making it differently than what you see here! You’ll know your cake is done baking when it feels springy and a toothpick inserted in the thickest part of the cake comes out clean or with a few moist crumbs. If your cake comes out with a domed top, just use a serrated bread knife to trim it down once it’s cooled. For the pics and video you see here, I used my favorite easy chocolate frosting. I love it because it’s so simple to make. 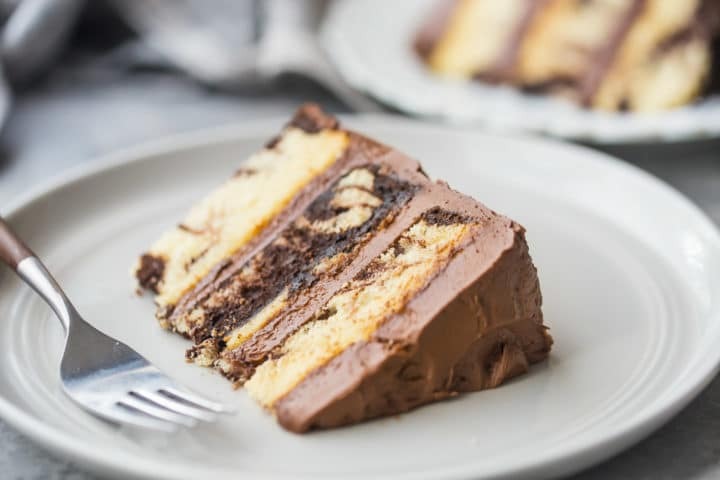 HOW LONG DOES MARBLE CAKE LAST? I recommend baking the cake layers the day before they’re filled and frosted. Allow them to cool completely, then wrap them tightly with plastic wrap and pop them in the fridge. This way, they’re easier to frost without getting crumbs in the buttercream. I also find that the cake somehow becomes more moist after it’s been refrigerated. Once the cake is filled and frosted, it will keep at room temperature for a day or so. In the refrigerator, it should stay good for several days to a week. The cake layers can also be frozen. They’ll keep for several weeks to a month in the freezer. You can frost them frozen, or allow them to thaw in the fridge first. 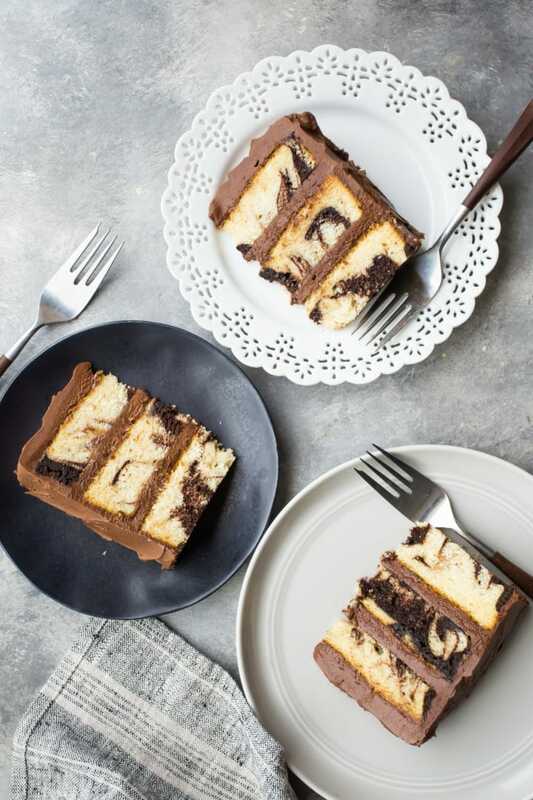 Next time you have a big occasion to celebrate, make this marble cake recipe! It’s incredibly moist, so simple to make, and sure to please everyone at the table! Beat the batter on medium speed for about a minute to a minute and a half, to aerate the cake batter and build the cake's structure. *Greek yogurt or buttermilk can be substituted. If you don't have buttermilk, you can substitute by stirring 2 teaspoons of white vinegar or lemon juice into 2/3 cup of regular milk. Allow the mixture to stand for 5 minutes, or until thickened and slightly curdled. **This cake can also be baked in two 8-inch or 9-inch diameter cake pans. The cake layers may bake up slightly thinner, and the bake times may need to be adjusted. If you just want to make chocolate cake, here is my favorite recipe: Chocolate Cake from Scratch. Hi. This looks so good. Did you mean 3/4 cup butter? Yes! I did! Sorry for the error Stephanie. It’s all fixed now. Oh my!! This looks amazing! Love a good marble cake. So happy you like it Sheenam! Thanks for the positive feedback! Yum! I love layer cakes. and marble can be tricky! Your recipe is fantastic and so yummy! Should that be 3/4 cup of butter in the recipe? Currently showing as 2 1/4 cups. Thank you! Thanks for the heads up Jodi! It’s all fixed now. Oh my goodness! Look at the layers of deliciousness! Hi! I would love to use this recipe for a half sheet cake . How do I adjust the measurements to make more cake mix? Hey Lakisha! What is the size of the pan you would like to bake this in? I baked this today using a 12 x 18 x 2 half sheet pan. 3 batches of this recipe was perfect. I also adjusted the baking time and temp to 300 F for 50 min. Great to know, thanks so much Sarah! I tried this and it’s a very moist cake! Highly suggest making this cake, although I would lessen the quantity of the sugar slightly! This is so good even without the frosting. So happy you liked it! Thanks for the positive review! Hi! I’m making an 11×15 sheet cake and I’d love to use your recipe. Any ideas how to increase the ingredients? I made your Simply Perfect Chocolate Cupcakes with Chocolate Swiss Meringue Buttercream frosting and they were insanely moist and delicious! Going to put your Swiss Meringue on the cake. I assume it would be fine in a pastry bag application?!?! It’s great in a pastry bag! Pipes beautifully. So happy you liked the cupcakes too! I’m not sure what the capacity is on your 11×15 pan, but I baked this recipe in a 10-cup bundt and it fit well. Good luck; I hope that’s helpful! I’m a little confused. Recipe says “1/2c of milk” . Is this buttermilk? Whole milk? 2%? Could you specify please? Also what is the baking time for 2 9inch pans? Making my sons birthday cake so I want to make sure I do this right! Thanks so much! Hi, I was wondering if any of the other ingredients need to be room temperature (besides the butter)? Hey Nancy! It’s always a good idea to have everything the same temp, but honestly I make this cake all the time, softening the butter but using everything else straight from the fridge, and it comes out just fine! Hi, I’m making this right now, can I use coarse Kosher salt? I don’t have another kind. Or I have sea salt, table salt or pink Himalayan. Thanks so much! Hey there! You can either grind the coarse salt up a little or use a bit less table salt. Hope that’s helpful! Hello! So I made this recipe and it tasted wonderful and was super moist! But after I baked it for about 40 min, it was breaking down whenever I tried to pick it up (after I cooled it), even after I inserted a toothpick and it came out clean. If you have any tips that may help me fix this problem that would be great! Also, thanks for the recipe! Hey Divya, so sorry you had trouble! I’m not sure exactly what you mean by “breaking down.” Was it falling apart? Double check and make sure you added the correct number of eggs because that is what is going to give strength to the cake. Also I find that the cake gains a lot of strength after it’s been chilled or frozen. A lot of times I will frost the layers while they’re still cold, and that makes the whole assembly a lot easier. Hope that’s helpful! Well I got it right on the second try and you’re right that cooling the cake really helps! Thank you for the advice and the great recipe! My pleasure Divya! I’m glad you found success! I loved the flavor of this cake, but I cannot figure out why it came out so dense! I thought I had followed the recipe exactly. It was still delicious, just not so cake-like. I think I’m going to try again. Any suggestions as to what I might have done wrong? I can’t really say without having been in the kitchen watching you… But it definitely should not be dense. When I make it it comes out quite delicate. Have a look at this article, perhaps it was something to do with the way you measured the ingredients: https://bakingamoment.com/how-to-measure-ingredients-for-baking/. Thank you for your feedback! I plan to try again. You mentioned it should be delicate; do you think this cake would hold up for a wedding cake? I think it would, depending on the number of layers. It would probably be a good idea to dowel it though, and put each tier on a cardboard round. Good luck!